Powered by tractor hydraulics. 18'x 16" trough.The Balfor conveyors are extremely robust and very durable. The fully bolted frame offers a strong and rigid structure and also allows the conveyor to be shipped disassembled, giving far reduced transport costs and also the possibility to reduce the size for storage. All conveyors are equipped with heavy duty tapered rollers for automatic belt centering, as well as screws to allow for the tension and running of the belt to be quickly adjusted. 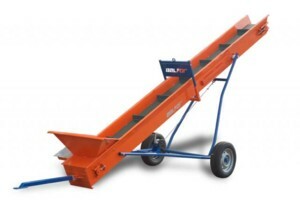 Conveyors are fitted with large diameter wheels for easy maneuvering off road, and an adjustable tow bar. The large capacity hopper can cope with a high throughput of timber, ideal for use with high production splitters and saws. The height and angle on the conveyor and be easily adjusted by hand via a mechanical gearbox to quickly allow for example a variety of vehicles to be loaded. The conveyors are inherently strong and ridged due to their tubular frame, giving a very long and trouble-free life. The lower part of the belt is contained by a metal plate, to avoid any jamming of timber and to avoid damage to the belt.